Bonefish Grill proudly refers to this appetizer as the “house specialty” and for good reason. This Bonefish Grill Bang Bang Shrimp recipe is a most delicious dish with bang-up flavor especially if you enjoy your food on the spicy side. Bang Bang Shrimp is all about the spice! 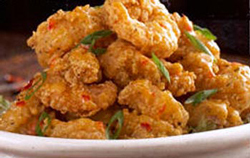 Tender, crispy shrimp get tossed in a light creamy, but spicy sauce. You can adjust the heat a bit with the amount of hot sauce you add. This recipe is very, very close to what we get at Bonefish. It starts off with shrimp that are coated with a seasoned flour-Panko breading, then fried till golden brown.We’ve served this dish many times for our “at-home date night” and for guests and it never disappoints! This entry was posted in Articles & Reviews - podcasts, apps, websites, recipes, videos, photography, Articles and reviews about excellent recipes and tagged Bang Bang Shrimp recipe, Bonefish Grill Bang Bang Shrimp, Bonefish Grill Bang Bang Shrimp copycat, Bonefish Grill Bang Bang Shrimp recipe, Bonefish Grill recipes, copy cat recipe for Bonefish Grill Bang Bang Shrimp, copycat recipes Bonefish Grill Bang Bang Shrimp, how to make Bang Bang Shrimp, how to make Bonefish Grill Bang Bang Shrimp, recipe for Bang Bang Shrimp, recipe for Bonefish Grill Bang Bang Shrimp.